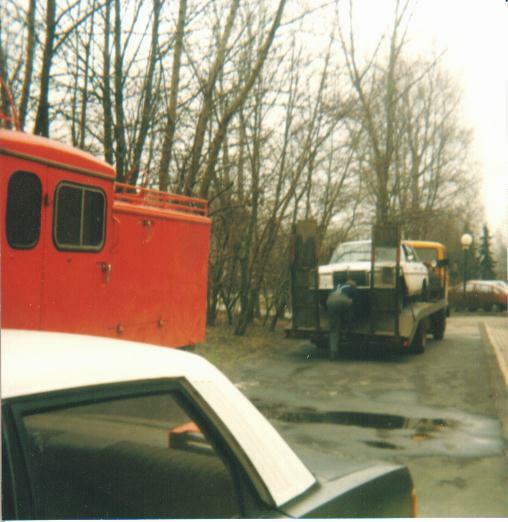 16.02.1987 We saw the announcement that a UNIMOG 404 S is offered used as frire truck at the first time. 25.02.1987 First view to the UNIMOG at the garage of the fire-fighter department Hamburg west, but we were not interested in this truck, the engine was broken, however the overall condition was not really bad. 04.03.1987 The truck can be very cheap (about 1600,- DM), so we visited it again. We found that the complete ignition system is not there, rest seems to be OK. We are interested now! 08.03.1987 We send our offer that we want to get the car. We tried to get it for 1900,- DM inclusive tax. 18.03.1987 We got it for 1900,- DM, however at this time we where not sure if it is a good deal but we have to bring it home. 23.03.1987 We bought an ignition system on a car scrap yard for a Mercedes Benz personal car. 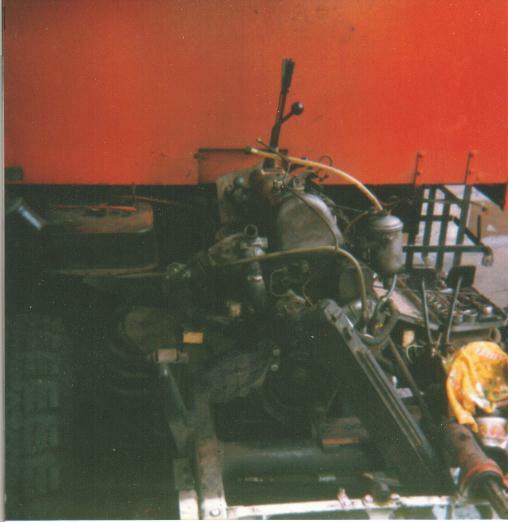 25.03.1987 Than we build the new ignition system into the UNIMOG, it fits but the engine will not start anyway. 27.03.1987 First visit of the UNIMOG scrap yard in Anderlingen. Bought a new mirror and other small parts. 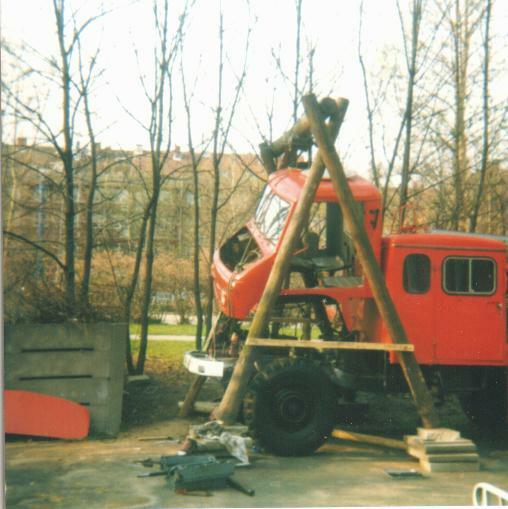 30.03.1987 Because of the broken engine we tow the UNIMOG with a VW-Bus from the garage of the fire-fighter department at home. To transport the UNIMOG with impunity of the gearbox we try to let the engine run during the towing. It worked, with the help of the bus the enginge starts but it runs very poor. Because of a leek in the cooling-water system the engine overheated during the transport. Nevertheless the gearbox is still in a good condition. 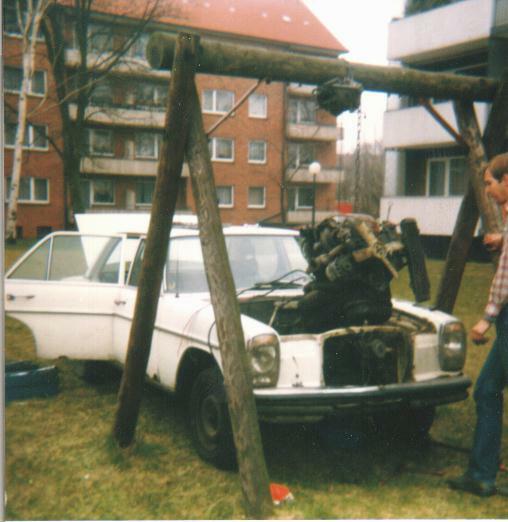 01.04.1987 We decided to by an old 220D car to use this engine for the truck. 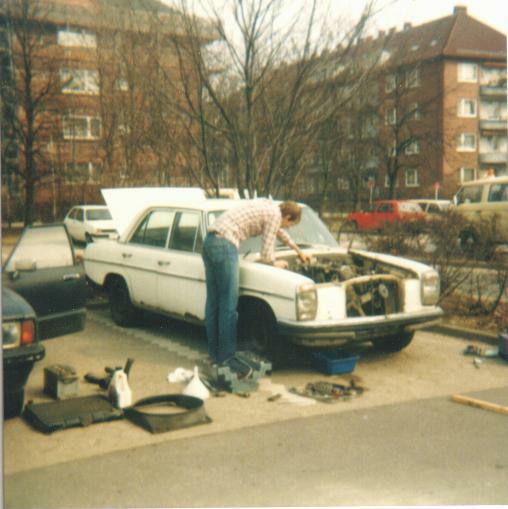 06.04.1987 We took of all useful parts from the 220D, maybe they can be usefull in the future. 11.04.1987 First attempt to remove the cabin. Problems to remove the steering-wheel, bad weather conditions. 14.04.1987 Warming of the steering-wheel helped, we got it. Unfortunately, the renovation of the 220D engine is to expensive for us, therefore we decide to leave the engine as it is, maybe we have later more money to renovate it. 17.04.1987 Problems to remove the cabin, it is to heavy. We decided to use the swing from the playground, but we have to dig it out first. 18.04.1987 7 hours digging, we have the swing where we want to use it. 01.05.1987 Modification of the flywheel: We want to use the old UNIMOG flywheel and the UNIMOG clutch together with the 220D engine. Therefore before the removal of the old flywheel we marked the position on the axis. The flywheel of the UNIMOG we have to be heaved in the same way the one from the 220D is. The preparation includes the filling of the convexity in the UNIMOG flywheel with zinc. The heave have to be done in a special machine shop. Thereafter we fix the new flywheel in the same position as the old one. This is very important! 03.05.1987 The metal plate between engine and gearbox need a few modifications, the bolts that keeps the engine in the right position (12 mm of the 220D) do not fit into the 8 mm wholes of the gearbox. Therefore two of the wholes can be drilled up to 12 mm, but one of the bolts have to be reduced to 8 mm on the gearbox side using a lathe. 12.05.1987 Letter to Mercedes Benz to get the technical OK from the manufacturer that the 220D fits into the UNIMOG. This is important for the technical acceptance. 23.05.1987 First preparations of the front engine holder. The engine is two cylinders shorter, the holder have to be build completely new to bridge the gap of about 20 cm. 24.05.1987 First parts finished. 3 blocks of metal about 40mm thick with lots of wholes for the screws. The concept is a new 12mm thick metal plate on the engine. 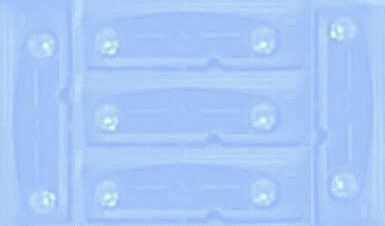 The distance between the plate and the engine have to be closed with the metal blocks. On the other side of the plate other blocks are needed to fix the old front engine holder. But the main problem now is the 12mm plate about 50 cm x 50 cm with a whole of about 20 cm for the v-belt disc. 26.05.1987 The metal blocks fit to the engine very well. The large heave plate is finished, that was a lot of work. Fortunately the plate fit to the blocks! All looks very solid. 28.05.1987 A few modifications on the oil sump where necessary. Additional holder between the front engine holder and the oil slump are prepared. 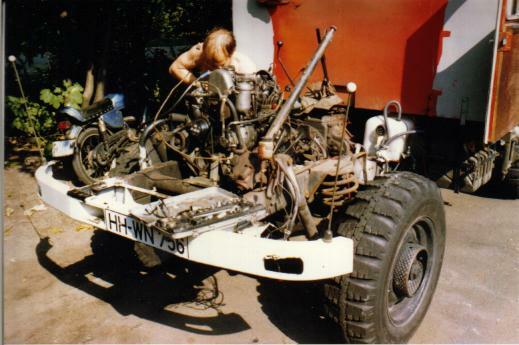 30.05.1987 The engine fixed in the UNIMOG on the backward side. The clutch is complete, the front holder are not fixed yet. Major modifications on the cabin where necessary. The engine is much bigger than the old one. Most space is needed in the food room on the driver side. Later major modifications are necessary here. 31.05.1987 The front holder of the engine make a lot of trouble, nothing worked as we thought. 05.06.1987 We fixed the problems with the front holder, but now we need large screws the fix the front holder. The screws must be long enough to fix the new horizontal plate on the traverse (See picture for details). We had problems to get the screws. 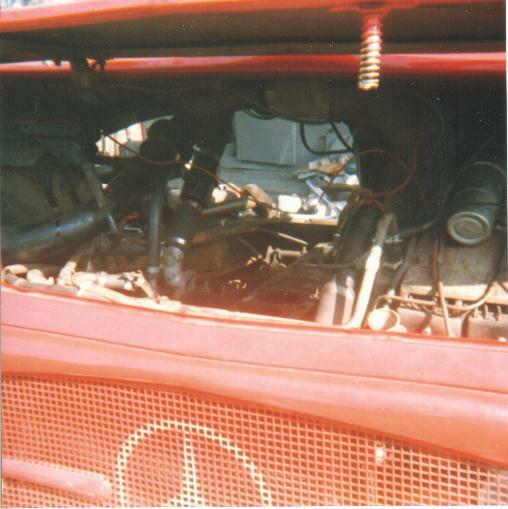 06.06.1987 Finaly we reused the screws from the old UNIMOG engine from the tophat. The engine is now fixed. Hopefully all will work as we thought ==> Yes, all was very solid, we did not have any problems with the holder (See picture). 08.06.1987 Cosmetical things done with the box. The wholes in the roof and in the floor are closed now. 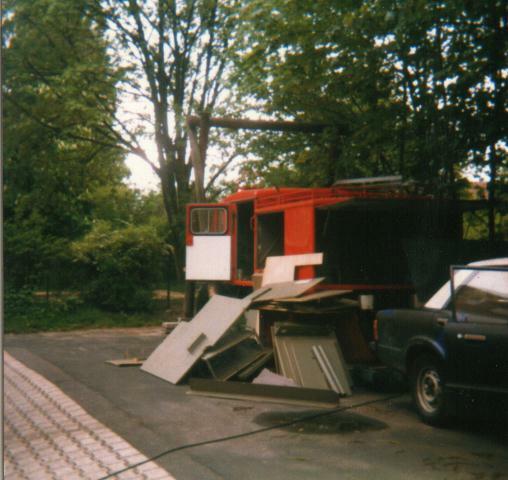 17.06.1987 Due to the removal of the metal walls in the box, we lost the main stability. Therefore we added new metal holder on both sides inside the box. 21.06.1987 Massive modifications on the exhaust pipe where necessary to fix the old UNIMOG exhauster with parts of the 220D together. Last modifications on the cabin, we do not have much space for the accelerator pedal. Moreover we had to modify the left side the shroud of the engine because the engine needs more space on this side as well. 23.06.1987 The original UNIMOG starter do not have enough power to start the 220D engine. We need a solution. 08.08.1987 After the summer break, we started today again with our lovely truck. We had enough time in the last month to think about the problem with the steering gear. Now we have a solution. With the help of a paperboard role we were able to put all the metal balls into the gearbox in the right position. Thereafter we screw the large thread of the steering gear over the metal balls. Using the whole on the bottom of the gearbox we where able to remove the paperboard role slowly. The steering gear is complete now, that was a waste job. 12.08.1987 First connections between the engine and the cabin. The oil pressure detector is connected. 18.08.1987 The v-belt disc is to close to our new engine holders. We prepared an aluminium distance disc for that. We want to reuse the original UNIMOG 24 V generator but we need a complete new holder. First attempt to build that. 29.08.1987 The steering wheel is back on it's place, the steering gear works fine, we did not destroy it with our action. 30.08.1987 The generator is prepared but not fixed so far. The brake pedal needs to be a little more smaller because we are not able to use the accelerator pedal. Therefore we cut the pedal in the middle. Now we have enough space. New electric connections where necessary to warm the engine before the start. We will use the old warming plugs with 12V. Therefore we use only one of the two batteries for the warming (this was not the best solution, because the one battery lost a lot of capacity during the start and the generator was not always able to charge the battery in that way we needed it for the next start). A few parts of the old 220D car where reused for the starting mechanisms. 01.09.1987 The connection between the accelerator pedal and the engine has been fixed. A lot of work for that, nothing really fits. 15.09.1987 The generator holder is fixed, again major changes where necessary but finally we got it. 21.09.1987 Most of the cooling system of the engine is fixed, we need additional tubes especially for the heating of the cabin. 25.09.1987 With models of the tubes we need we drove again to a car scrap yard, we got the most and add all to the UNIMOG. Light lost of water, nothing dramatic - fixed! 03.10.1987 Even with new charged batteries we where not able to start the engine. The starter do not have the power. 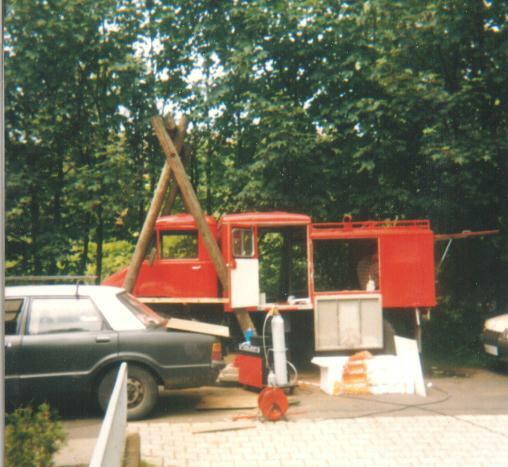 10.10.1987 With the help of my old FORD TAUNUS we where able to start the engine by pulling the car the first time. Good feeling ! Nothing brook down the UNIMOG was able to drive alone back to the parking place. To solve the starter problem with a trick: We bought a used Mercedes starter form a car with 12 V. We had to renovate this starter completely because we want to use it with 24 V. Special parts where necessary (the electric magnet for 24 V for this starter, etc.). 17.10.1987 The 12 V starter is able to start the engine with 24 V. We hope it will do it also for a longer period ==> it did, we had no problems later with it! The UNIMOG is ready for the first trip! 21.11.1987 A few thinks had to be done but this weekend we started our first tour (altogether 450 km) the UNIMOG is very loud, consumes about 20l/100km but we hope we can make something against it (no idea what, but it is now winter time, no weather to work). That's all folks, the modifications on the box where not as interesting as the first part and I did not make notes about it. It takes about 3 month in 1988. Most parts we used are reused and therefore extremely cheap. This page has been accessed since 02.2001: times.